Hey, folks, happy July 4th. Don't do anything I'd do. Anyhoo, I just saw this story and thought it was kind of cool. It's about John Hancock's signature on the Declaration of Independence. "There are a lot of stories surrounding the Declaration of Independence. One of the most famous concerns John Hancock and his comically large signature. 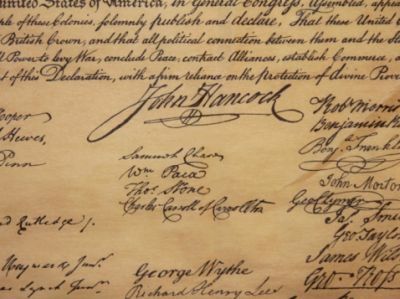 According to legend, the founding father signed his name bigger than everyone else's because he wanted to make sure "fat old King George" could read it without his spectacles. It's a neat story about American brashness, but it isn't very accurate. The truth is a tad less dramatic. Snopes.com explains that Hancock, president of the Continental Congress, gave a super-sized signature not because he was itching for a fight with the king, but because, among other things, he happened to be the first person to sign the document. Because Hancock was the first to sign, he did the sensible thing and put his name front and center. He was the leader of the Congress, after all. He didn't know his fellow patriots would sign their names on a smaller scale. So, why are some of the other signatures high and to the left while others are down and to the right? 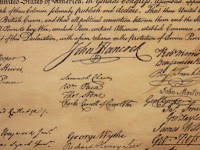 The National Archives explains, "In accordance with prevailing custom, the other delegates began to sign at the right below the text, their signatures arranged according to the geographic location of the states they represented. New Hampshire, the northernmost state, began the list, and Georgia, the southernmost, ended it." And it's worth remembering that signing one's name to the Declaration of Independence was no small thing. Those who signed the document were sure to be hanged for treason should they be caught." You can find the rest of the story right smack here. Have a good one.